Samsung started rolling out the Android 7.0 Nougat update for the Galaxy S7 and Galaxy S7 edge last week. Well, the company has now reportedly halted the update due to some issues. According to the reports coming from China, Samsung has halted the roll out of Android 7.0 Nougat update for Galaxy S7 and Galaxy S7 edge. And, as far as the Galaxy S7 edge is concerned, Samsung is rolling out the Beta update again for the users in China. As of now, there’s no information whether Samsung is rolling out a Beta build again for the Galaxy S7 as well. It’s surprising to see Samsung halting the official build and rolling the Beta build again given the fact that the Beta program ended last year. The Beta update which is being rolled out for the Galaxy S7 edge is sized similarly to the official build which started rolling out last week. 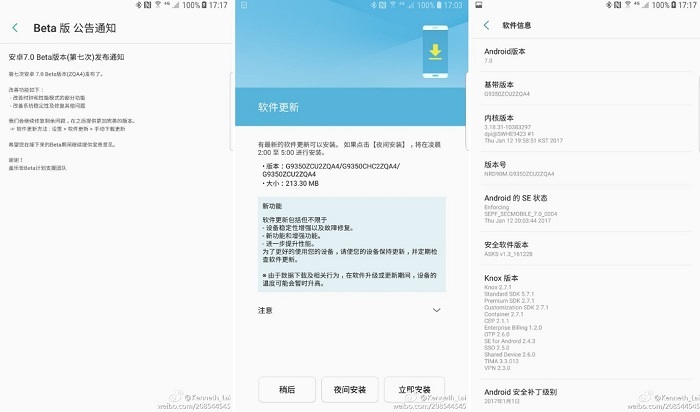 The Beta update with build number G9350ZCU2ZQA4 is said to bring stability and performance improvements along with enhanced power saving mode. Also, at the time of writing this, there’s no information whether Samsung has only halted the update in China or this is the scenario in other markets as well.